Białowieża Forest (Belarusian: Белавежская пушча, Biełaviežskaja Pušča; Polish: Puszcza Białowieska Polish pronunciation: [ˈpuʂt͡ʂa ˌbʲawɔˈvʲɛska] ( listen); Russian: Беловежская пуща, Belovezhskaya Pushcha) is one of the last and largest remaining parts of the immense primeval forest that once stretched across the European Plain. The forest is home to 800 European bison, Europe's heaviest land animal. UNESCO’s Man and the Biosphere Programme designated the Polish Biosphere Reserve Białowieża in 1976 and the Belarusian Biosphere Reserve Belovezhskaya Puschcha in 1993. In 2015, the Belarusian Biosphere Reserve occupied the area of 216,200 ha (2,162 km2; 835 sq mi), subdivided into transition, buffer and core zones. The forest has been designated a UNESCO World Heritage Site and an EU Natura 2000 Special Area of Conservation. The World Heritage Committee by its decision of June 2014 approved the extension of the UNESCO World Heritage site “Belovezhskaya Pushcha/Białowieża Forest, Belarus, Poland”, which became “Białowieża Forest, Belarus, Poland”. It straddles the border between Poland (Podlaskie Voivodeship) and Belarus (Brest and Grodno voblasts), and is 70 kilometres (43 miles) north of Brest, Belarus and 62 kilometres (39 miles) southeast of Białystok, Poland. The Białowieża Forest World Heritage site covers a total area of 141,885 ha (1,418.85 km2; 547.82 sq mi). Since the border between the two countries runs through the forest, there is a border crossing available for hikers and cyclists. The Białowieża Forest is named after the Polish village of Białowieża, which is located in the middle of the forest and was probably one of the first human settlements in the area. Białowieża means "White Tower" in Polish. The name stems from the white wooden hunting manor established in the village by Władysław II Jagiełło, the King of Poland who ruled the country from 1386 until his death in 1434 and enjoyed going on hunting trips in the forest. The modern Belarusian name for the forest is Biełaviežskaja pušča (Белавежская пушча), although both the Belarusian authorities and UNESCO use the official Russian name Belovezhskaya pushcha (Беловежская пуща) from before the dissolution of the Soviet Union. On the Polish side, part of the Białowieża Forest is protected as the Białowieża National Park (Polish: Białowieski Park Narodowy), with an area of about 105 km2 (41 sq mi). There is also the Białowieża Glade (Polish: Polana Białowieska), with a complex of buildings once owned by the tsars of Russia during the Partitions of Poland. At present, a hotel and restaurant with a car park is located there. Guided tours into the strictly protected areas of the park can be arranged on foot, bike or by horse-drawn carriage. Approximately 120,000–150,000 tourists visit the Polish part of the forest annually (about 10,000 of them are from other countries). Among the attractions are birdwatching with local ornithologists, the chance to observe rare birds, pygmy owl observations, watching bison in their natural environment, and sledge as well as carriage rides, with a bonfire. Expert nature guides can also be found in the nearby urban centres. Tours are possible all year round. The popular village of Białowieża lies within the forest. Białowieża means "the white tower" in Old Polish. 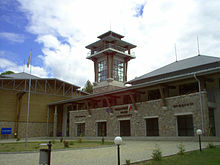 In 2009, the Ecological Education Centre was built in the Belovezhskaya Pushcha National Park. On the Belarusian side, the forest is protected as the Belovezhskaya Pushcha National Park with an area of 1,771 km2 (684 sq mi). The core, strictly protected, area covers 157 km2 (61 sq mi), the buffer zone 714 km2 (276 sq mi), and the transition zone 900 km2 (350 sq mi); the National Park and World Heritage Site comprises 876 km2 (338 sq mi). The Belovezhskaya pushcha headquarters at Kamyanyuki include laboratory facilities and a zoo where European bison (reintroduced into the park in 1929), konik (a semi-wild horse), wild boar, Eurasian elk and other indigenous animals may be viewed in enclosures of their natural habitat. A new attraction there is a New Year's museum with Ded Moroz (the East Slavic counterpart of Father Christmas). The entire area of northeastern Europe was originally covered by ancient woodland similar to that of the Białowieża Forest. Until about the 14th century, travel through the woodland was limited to river routes; roads and bridges appeared much later. Limited hunting rights were granted throughout the forest in the 14th century. In the 15th century the forest became a property of king Władysław II Jagiełło. A wooden manor in Białowieża became his refuge during a plague pandemic in 1426. The first recorded piece of legislation on the protection of the forest dates to 1538, when a document issued by Sigismund I instituted the death penalty for poaching a bison. The King also built a new wooden hunting manor in a village of Białowieża, which became the namesake for the whole complex. Since Białowieża means the "white tower", the corresponding Puszcza Białowieska translates as the "forest of the white tower". The Tower of Kamyenyets on the Belarusian side, built of red brick, is also referred to as the White Tower (Belaya Vezha) even though it was never white, perhaps taking the name from the pushcha. The forest was declared a hunting reserve in 1541 to protect bison. In 1557, the forest charter was issued, under which a special board was established to examine forest usage. In 1639, King Vladislaus IV issued the "Białowieża royal forest decree" (Ordynacja Puszczy J.K. Mości leśnictwa Białowieskiego). The document freed all peasants living in the forest in exchange for their service as osocznicy, or royal foresters. They were also freed of taxes in exchange for taking care of the forest. The forest was divided onto 12 triangular areas (straże) with a centre in Białowieża. Until the reign of King John II Casimir, the forest was mostly unpopulated. However, in the late 17th century, several small villages were established for development of local iron-ore deposits and tar production. The villages were populated with settlers from Masovia and Podlaskie and many of them still exist. After the Partitions of Poland, Tsar Paul I turned all the foresters into serfs and handed them over to various Russian aristocrats and generals along with the parts of forest where they lived. Also, a large number of hunters were able to enter the forest, as all protection was abolished. Following this, the number of bison fell from more than 500 to fewer than 200 in 15 years. However, in 1801, Tsar Alexander I reintroduced the reserve and hired a small number of peasants to protect the animals, and by the 1830s there were 700 bison. However, most of the foresters (500 out of 502) took part in the November Uprising of 1830–31, and their posts were abolished, leading to a breakdown of protection. Tsar Alexander II visited the forest in 1860 and decided to re-establish the protection of bison. Following his orders, locals killed all predators: wolves, bears and lynx. Between 1888 and 1917, the Russian tsars owned all of primaeval forest, which became the royal hunting reserve. The tsars sent bison as gifts to various European capitals, while at the same time populating the forest with deer, elk and other animals imported from around the empire. The last major tsarist hunt took place in 1912. During World War I the forest suffered heavy losses. The German army seized the area in August 1915 and started to hunt the animals. During three years of German occupation, 200 kilometres (124 miles) of railway tracks were laid in the forest to support the local industry. Three lumber mills were built, in Hajnówka, Białowieża and Gródek. Up to 25 September 1915, at least 200 bison were killed, and an order was issued forbidding hunting in the reserve. However, German soldiers, poachers and Soviet marauders continued the slaughter until February 1919 when the area was captured by the Polish army. The last bison had been killed just a month earlier. Thousands of deer and wild boar had also been shot. After the Polish–Soviet War in 1921, the core of the forest was declared a National Reserve. In 1923, Professor Józef Paczoski, a pioneer of the science of phytosociology, became a scientific manager of the forest reserves in the Białowieża Forest. He carried out detailed studies of the structure of forest vegetation there. In 1923 it was known that only 54 European bison survived in zoos all around the world, none of them in Poland. In 1929, a small herd of four was bought by the Polish state from various zoos and from the Western Caucasus (where the bison was to become extinct just a few years later). These animals were of the slightly different Caucasian subspecies (Bison bonasus caucasicus). To protect them, in 1932 most of the forest was declared a national park. The reintroduction proved successful, and by 1939 there were 16 bison in Białowieża National Park. Two of them, from the zoo in Pszczyna, were descendants of a pair from the forest given to the Duke of Pszczyna by Tsar Alexander II in 1865. In 1939 the local inhabitants of Polish ethnicity were deported to remote areas of the Soviet Union and replaced by Soviet forest workers. In 1941 the forest was occupied by Germans and the Russian Soviet inhabitants were also expelled. Hermann Göring planned to create the largest hunting reserve in the world there. After July 1941 the forest became a refuge for both Polish and Soviet partisans and Nazi authorities organised mass executions. A few graves of people who were killed by the Gestapo can still be seen in the forest. In July 1944 the area was liberated by the Red Army. Withdrawing Wehrmacht troops demolished the historic Białowieża hunting manor. After the war, part of the forest was divided between Poland and the Belarusian SSR of the Soviet Union. The Soviet part was put under public administration while Poland reopened the Białowieża National Park in 1947. Belovezhskaya Pushcha was protected under Decision No. 657 of the Council of People's Commissars of the Soviet Union, 9 October 1944; Order No. 2252-P of the USSR Council of Ministers, 9 August 1957; and Decree No. 352 of the Byelorussian SSR Council of Ministers, 16 September 1991. In December 1991, the Belavezha Accords, the decision to dissolve the Soviet Union, were signed at a meeting in the Belarusian part of the reserve by the leaders of Ukraine, Russia and Belarus. 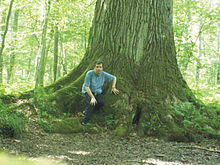 The forest contains a number of large, ancient pedunculate oaks (Quercus robur), some of which are individually named. Trunk circumferences are measured at breast height, 130 cm (51 in) above the ground. Great Mamamuszi. Circumference 690 cm (270 in) (2005), height 34 m (112 ft). One of the thickest oaks in the forest, with a beautiful column-like trunk. The tree's name comes from Molière's The Bourgeois Gentleman, in which the main protagonist (Mr Jourdain) was appointed the Mamamouchi by a Turkish ambassador. Since 1989 the tree's circumference grew by 10 cm (3.9 in). 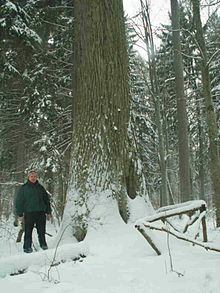 Of all the oaks in Białowieża Forest with a circumference above 600 cm (240 in), it is in the best condition. The King of Nieznanowo. Circumference 620 cm (240 in), height 38 m (125 ft). This tree has one of the most columnar trunks among the oaks in Białowieża Forest. The first branches arise at the height of 18 m. It has been gradually dying since 1998. As of 2005[update], only two small branches still have leaves. Since the mid-1960s its trunk circumference has grown by about 45 cm (18 in). Southern Cross. Circumference 630 cm (250 in), height 36 m (118 ft). At the base of the trunk it has a considerable lesion in the bark on the eastern side. From the mid-1960s its circumference has grown by 65 cm (26 in). The name comes from the shape of its crown, whose main branches evoke a cross. Barrel Oak. Circumference 740 cm (290 in), height over 30 m (98 ft). This tree is named for its barrel-shaped trunk, and is the oak which reaches the greatest trunk circumference among the Białowieża oaks. The tree is dead and largely devoid of bark, and is estimated to be around 450 years old. Dominator Oak. Circumference 680 cm (270 in), height over 36 m (118 ft). One of the thickest oaks of the Białowieża, the tree has been dead since 1992 and its trunk is now largely devoid of bark. For many years it dominated the Białowieża Forest as far as size is concerned. Its age is estimated at 450 years. The Jagiełło Oak. Circumference (when growing) 550 cm (220 in), height 39 m (128 ft). It blew down in 1974, but is probably the most famous of the trees in the forest. It is said that King Władysław II Jagiełło rested beneath it before the Battle of Grunwald in 1410, although the tree is believed to have been only 450 years old when it blew down. Tsar Oak (Polish) (Polish: Dąb Car) of Poland. Circumference 640 cm (250 in), height 41 m (135 ft). The tree's volume has been estimated at 75 m3 (2,600 cu ft). It died in 1984, and for over 20 years it has been standing dead on the edge of the valley of Leśna Prawa river. Today the trunk is totally devoid of bark and some of the branches have broken off and lie at the base of the trunk. Patriarch Oak (Russian: Патриарх-Дуб). 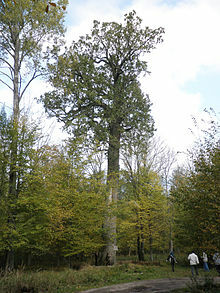 One of the oldest oaks in the Belarusian National Park, standing 31 m (102 ft) tall, having a diameter in excess of 2 m (6.6 ft), and being over 550 years of age. It stands 1 kilometre (0.6 miles) from the estate of Ded Moroz. Some 84% of the 60,000 hectares (150,000 acres) of Polish forest is outside the national park; almost half of all the wood in the forest is dead — 10 times more than in managed forests — with half the 12,000 species depend on decaying logs, including the near-threatened beetle Cucujus cinnaberinus. Traditional forest management would remove the dead wood, as a fire risk. In 2011, Zdzisław Szkiruć, director of the Białowieża National Park, told British newspaper The Guardian that cutting and replanting allows for re-establishment of the forest in 50 years, rather than the 300–400 years that nature would require; environmentalist Janusz Korbel argued that the unique nature of the primeval forest demands a lighter style of management. Andrzej Kraszewski, Poland's Environment Minister from February 2010 to November 2011, sought to increase protection over the whole forest, starting with a more modest 12,000–14,000-hectare (30,000–35,000-acre) expansion, against opposition from the local community and the Forestry Service. Environmentalists say that logging is threatening the flora and fauna in the forest, including species of rare birds, such as the white-backed woodpecker, who lost 30% of their population in forestry-managed areas in the 1990s and 2000s. Poland's state forestry board claims the logging is for protection and for ecological reasons, protecting against the European spruce bark beetle. From 2012, the amount of wood that can be extracted by foresters annually was reduced from about 120,000 m3 (4,200,000 cu ft) to just 48,500 m3 (1,700,000 cu ft) and most of it is sold locally, mainly as firewood. On 25 March 2016, Jan Szyszko, Poland's Environment Minister, former forester and forestry academic, announced that he would approve a tripling of logging in the forest, from the 2012–21 limit of 63,000 m3 (2,200,000 cu ft) — almost exhausted at the time — to 188,000 m3 (6,600,000 cu ft), again described as being necessary to combat an infestation of the bark beetle. Robert Cyglicki, head of Greenpeace Polska, argued that logging to fight the bark beetle would "bring more damage than benefits", gathering more than 120,000 signatures to petition Prime Minister Beata Szydło to reverse Szyszko's move. Greenpeace also said the logging could trigger the EU to launch punitive procedures against Poland for violating its Natura 2000 programme, though Szyszko claims that the logging plans would not apply to strictly protected areas, and claims that, rather than being 8,000 years old, as scientists claim, parts of the forest had been created by an "enterprising hand of man" on lands that centuries ago included fields of wheat and millet. Large-scale logging started in 2017. 190 cubic metres of wood (160,000 to 180,000 trees) was felled, the largest volume of logging since 1988. The Polish government has ignored pleas from UNESCO to stop logging the old-growth parts of the forest, as well as a court order of the European Court of Justice to halt the logging activities. The final verdict fell on 17 April 2018, ruling that EU law has been infringed. The forest is the subject of a Russian ballad Belovezhskaya Pushcha, composed in 1975 by Aleksandra Pakhmutova, with lyrics by Nikolai Dobronravov, performed by Belarusian folk band Pesniary. The forest is mentioned throughout Alan Weisman's book The World Without Us (2007), which investigates places that have been abandoned or left alone and imagines what they would be like if Earth's human population suddenly disappeared. The forest is also featured as the backdrop for the 2008 World War II film Defiance,, a true story about more than 1,000 people who retreated to the forest to hide from the Nazis. Jurgis Rudkus, the Lithuanian protagonist of Upton Sinclair's The Jungle, is said to have been born to a family of peasants in "that part of Lithuania known as Brelovicz" which could be interpreted as the Białowieża area. British historian Simon Schama dedicates several chapters of his book Landscape and Memory (1995) to the Białowieża Forest. In late 2017, Wojtek Voiteque Kowalik, a senior copy editor at the Polish advertising firm Ogilvy, decided to work with Greenpeace Poland to spread awareness of the Białowieża Forest and the logging threatening it. Kowalik decided to use the game Minecraft, as he wanted to capitalize on its playerbase of 87 million. Kowalik reasoned Minecraft was a form of social media, drawing parallels between the YouTube and Twitch communities dedicated to the game and the video arcades of his youth. Kowalik contacted Danish company GeoBoxers, who had previously recreated all of Denmark in Minecraft in 1:1 scale, and convinced them to do the same for Białowieża Forest. In return Ogilvy and Greenpeace provided reference material for Geoboxers in the form of a 3D topographical map of the 700-square-kilometre (270 sq mi) forest made from hundreds of images and maps of Białowieża Forest that took six weeks to complete. ^ UNESCO World Heritage Centre. "UNESCO World Heritage Centre – Decision – 38COM 8B.12". unesco.org. Retrieved 27 May 2015. ^ Baczynska, Gabriela (28 September 2008). "Climate change clouds fate of ancient Polish woods". Reuters. Retrieved 28 September 2008. ^ "Biosphere Reserve Information – Bialowieza". Retrieved 23 May 2015. ^ "Biosphere Reserve Information – Belovezhskaya Puschcha". Retrieved 23 May 2015. ^ "Биосферный резерват «Беловежская пуща» обрел современную территориаль…". brest.by. 24 May 2015. Archived from the original on 24 May 2015. Retrieved 2 April 2018. ^ "21 World Heritage Sites you have probably never heard of". The Daily Telegraph. ^ "Decision 38 COM 8B.12 of the World Heritage Committee" (PDF). whc.unesco.org. ^ "Białowieża Forest, Belarus, Poland". UNESCO/WHC website. Retrieved 27 May 2015. 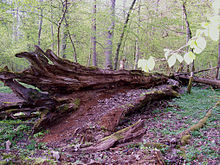 ^ "Belovezhskaya Pushcha/Białowieża Forest" at the UNESCO official webpage. Retrieved November 28, 2012. ^ Belovezhskaya Pushcha National Park – Official Website of the Republic of Belarus. ^ Belovezhskaya pushcha – Belarusian Ministry of Foreign Affairs. ^ a b c "PTTK Bialowieza: About us". pttk.bialowieza.pl. Archived from the original on 22 November 2009. ^ "Birds rarities « Białowieża Forest guide – Arek Szymura "Pygmy owl" Nature tours". bialowiezaforest.eu. ^ "Pygmy owl whistling « Białowieża Forest guide – Arek Szymura "Pygmy owl" Nature tours". bialowiezaforest.eu. ^ "Peaceful out of season time... « Białowieża Forest guide – Arek Szymura "Pygmy owl" Nature tours". bialowiezaforest.eu. ^ Zdzisław Pucek, European Bison (Bison Bonasus): Current State of the Species. Council of Europe, 2004. ISBN 9287155496. ^ The story of the White Tower of Kamyanyets. 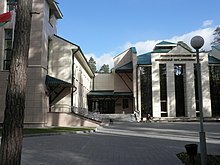 Belavezhskaya Pushcha. (in Russian). ^ a b c d e f Damian Carrington (6 April 2011). "Poland's environmentalists fight foresters for heart of primeval forest". The Guardian. Retrieved 26 March 2016. ^ Rudolf, John Collins (12 August 2010). "The Last Stand? Rallying Behind a Primeval Forest". Green Blog. ^ Agence France-Presse (12 September 2010). "Logging spells danger for Europe's last primeval forest". Terra Daily. ^ a b c d Anna Koper; Marcin Goettig (25 March 2016). "Polish minister approves tripling of logging in ancient forest". Reuters. Retrieved 26 March 2016. ^ a b "Poland approves large-scale logging in Europe's last primeval forest". The Guardian. Agence France-Presse. 26 March 2016. Retrieved 26 March 2016. ^ Christian Davies (23 May 2017). "'My worst nightmares are coming true': last major primeval forest in Europe on 'brink of collapse'". The Guardian. Retrieved 24 August 2017. ^ "Scars of the Primeval Forest – What Really Happened in the Oldest Forest of Europe". BIQDATA. Retrieved 23 August 2018. ^ "UNESCO urges Poland to stop logging ancient forest". EURACTIV. 6 July 2017. Retrieved 24 August 2017. ^ "EU court orders Poland to stop logging in Białowieża forest". The Guardian. Reuters. 28 July 2017. Retrieved 24 August 2017. ^ "C-441/17 - Commission v Poland". Retrieved 23 August 2018. ^ "Białowieza: destructive logging in Polish Primeval Forest". BIQdata/EDJNet. 19 April 2018. Retrieved 23 August 2018. ^ "The forest management operations concerning the Puszcza Białowieska Natura 2000 site that have been undertaken by Poland infringe EU law" (PDF). Court of Justice of the European Union. 17 April 2018. Retrieved 23 August 2018. ^ "Belovezhskaya Pushcha", from the official website of Aleksandra Pakhmutova, with copyrighted lyrics and a MIDI sample. ^ Deighton, Katie (21 January 2018). "Minecraft marketing: how Ogilvy & Greenpeace tapped gamer platforms to combat deforestation". The Drum. Retrieved 2 May 2018. ^ McKeand, Kirk (26 January 2018). "How Minecraft helped save one of the world's biggest primeval forests". PC Games News. Retrieved 2 May 2018. ^ Natividad, Angela (22 January 2018). "How Greenpeace Used Minecraft to Stop Illegal Logging in Europe's Last Lowland Primeval Forest". AdWeek. Wikimedia Commons has media related to Białowieża Forest. Wikivoyage has a travel guide for Białowieża National Park.